. 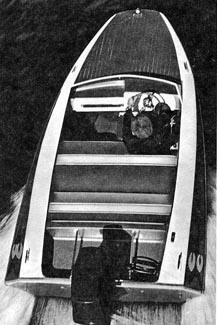 Construction innovations include built in tanks in each sponson, additional transom bracing, double thickness marine plywood tunnel planks plus clear step by step assembly drawings that the amateur boat builder can readily understand. 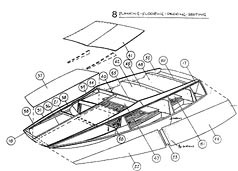 Step by step instructions for our boat kits have been designed for those who have never built a boat before. As you can see in the drawing above, each part of the hull is assigned a number, this number in turn is imprinted on each piece of mahogany and marine plywood that is included in the complete boat kit. Using this technique an amateur can easily assemble any Clark Craft complete kit listed in this catalog. MAX. HULL DEPTH 2' 2"